to nurture a way of life marked by faith-filled worship, fellowship and service to You and to one another. Teach us to be faithful servants of Your gifts, knowing that we are all laborers in Your vineyard, working to build the Kingdom on earth. With the intercession of our Blessed Mother and Saint Joseph, may we return ten-fold the gifts entrusted to us. Bless our capital campaign with a deeper devotion to prayer, a growing commitment for service, and an increasing level of generosity as we focus to build the future today. We are selling commemorative items as a renovation fundraiser and to mark the dedication of our new Sanctuary. Order forms are in the narthex and can be put in a sealed envelope and put in the weekly collection or in the office lock box. We have limited items remaining. Please help support our renovation. "Please Don't throw away your tickets until the prize is claimed." Congratulations to our lucky winner Murray Britt who claimed his prize of $3,675.00! Thank you to everyone who supported our Capital Campaign Fundraiser. Please continue to pray for our renovation and stay turned for another 50/50 draw coming this summer! This weekend we started promoting a new joint initiative with the Knights of Columbus Council of our Parish. 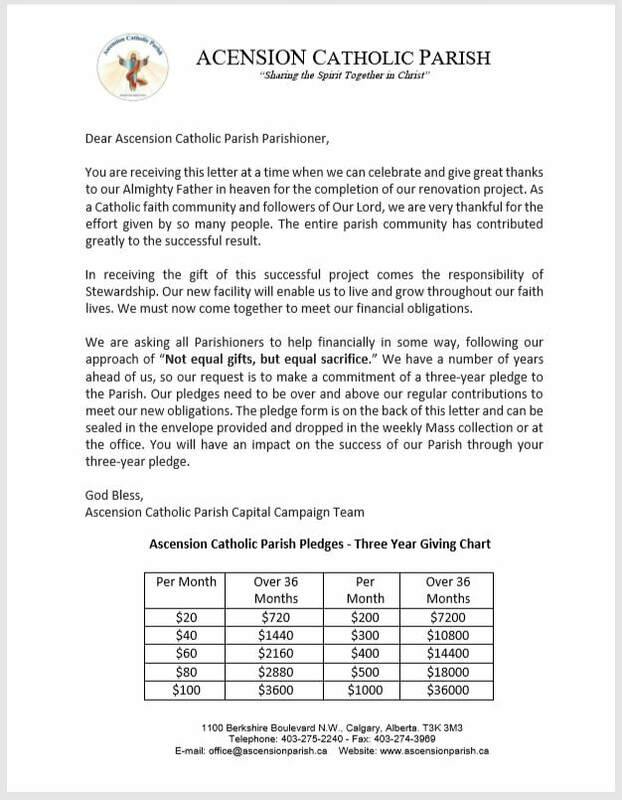 The Capital Campaign team encourages Ascension parishioner to participate in the Knight of Columbus Store Cards Program. By adjusting our spending habits (groceries, gasoline, restaurants & entertainment) and using store cards, we can all make a valuable contribution to our Parish. A percentage of the revenue from the Store Cards Program sales will be committed toward the Capital Campaign for the renovation of our church building. See the short slideshow here to get an idea. The Capital Campaign Team organized a Prayer Vigil on Friday May 5, 2017. It started at 9:30 am following the daily Mass. Adoration continued for 12 hours, each hour had a special intention. Many parishioners signed up and dedicated an hour of adoration in support of our renovation. Benediction happened at 9:20 pm, and was followed by fellowship after the vigil. The Capital Campaign Team hosted, with help of many volunteers, the Renovation Garage Sale the weekend of April 29/30. The Capital Campaign Team would like to extend a gracious thank you to those who attended the 2017 Gala Celebration dinner. With everyone’s generosity and prayers we were able to raise $22,528! This was a memorable event shared with our fellow parishioners, friends and family who attended. We look forward to continuing to build our future today and become a stronger and more vibrant community.